Remember the other day how I told I was (TRYING) to be on a health kick? It’s certainly easier than it used to be considering how much cleaner my diet is over all, but more difficult because jeez, every year, that’s just the way it is ladies, huh? But I do have to say, eating these gorgeous Salmon Steaks was no sacrifice at all- the simplicity of the cooking process and the speed of making the sauce honestly made this a 10 minute dish!!! Isn’t that crazy!? Anything that can be made in 10 minutes that is of this caliber is perfect in my book- hope you enjoy! Combine all of the ingredients in the bowl of a food processor and puree until you have a well combined sauce. Season to taste with kosher salt and set aside. In a small bowl, combine the lime juice, zest and olive oil. 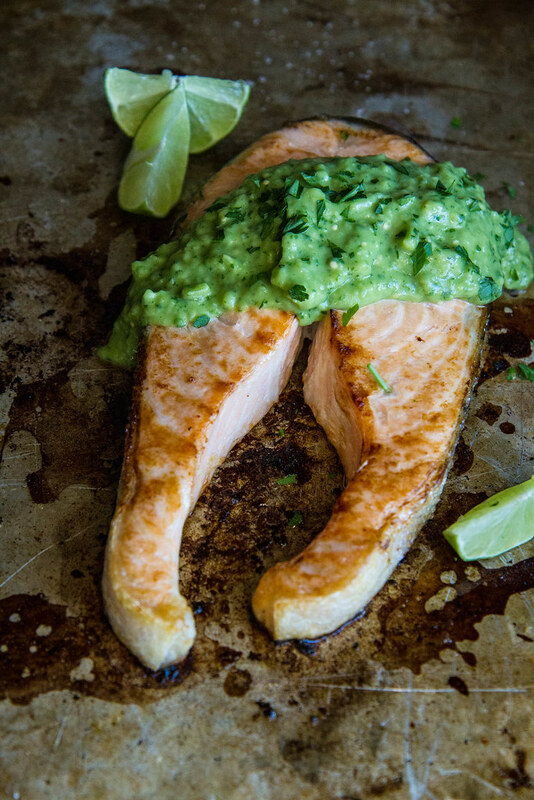 Place the salmon steaks on a sheet pan and pour the lime juice and oil over the steaks. Sprinkle them generously with kosher salt. Broil the steaks for 5 minutes. Serve the steaks hot with a generous scoop of Creamy Avocado Sauce. Love these beautiful flavors with the salmon!! Great recipe! Yum! Definitely making this. Are the salmon steaks fresh or frozen? I’ve never seen salmon steaks in the store. Hey Kristin- just ask your fish monger. i just bought these fresh at Metropolitan Market. I know Uwajimaya always has them too. But most grocery stores will cut whole fish how you want it. That is one tasty looking salmon dinner! It is tasty! thank you Kevin! This is such a pretty dish! Love how bright and fresh the sauce looks! Gaby- you love it because it’s full of your favorite food on eath, Avocado!!! Do you seed your jalapeño? I didn’t & it’s got a kick! 🙂 The sauce is amazing – bright & fresh with some heat. Can’t wait to try it with the salmon. I like it spicy K, so I don’t- but the jalapeno’s are particularly spicy lately! It’s good spicy …. and um, this recipe is absolutely FANTASTIC!!!!!!! SO delicious! Seriously, freaking amazing! 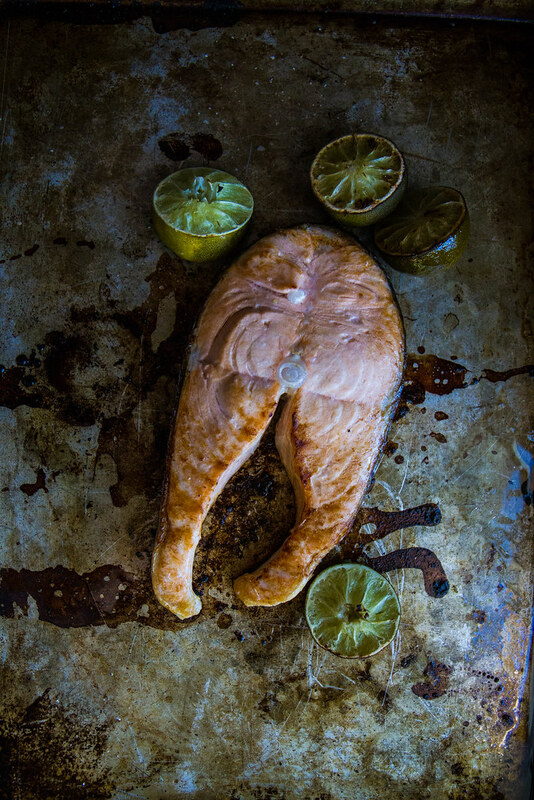 Love all the flavors – this will be my new ‘go to’ salmon recipe! Oh this salmon with that sauce!! I’m diving in!! Mmm just a glance at the picture and my mouth waters! Can you say yum! I do have one question tho, where can i find the recipe for the creamy avocado sauce? I fear if i dont get that right, itll throw off the salmon itself…..thanks!!! Hi Monica- the recipe for the sauce is right in the recipe. Let me know if you are having trouble locating it? Oh thats right! I totally missed it, thanks do much!! Wish me luck with dinner tonight!!! Just as an FYI…in Chrome the printed recipe doesn’t render correctly. The instructions are covered up by a box with all your blog info. Recipe looks great, though! We’re making it tonight. This salmon looks terrific! 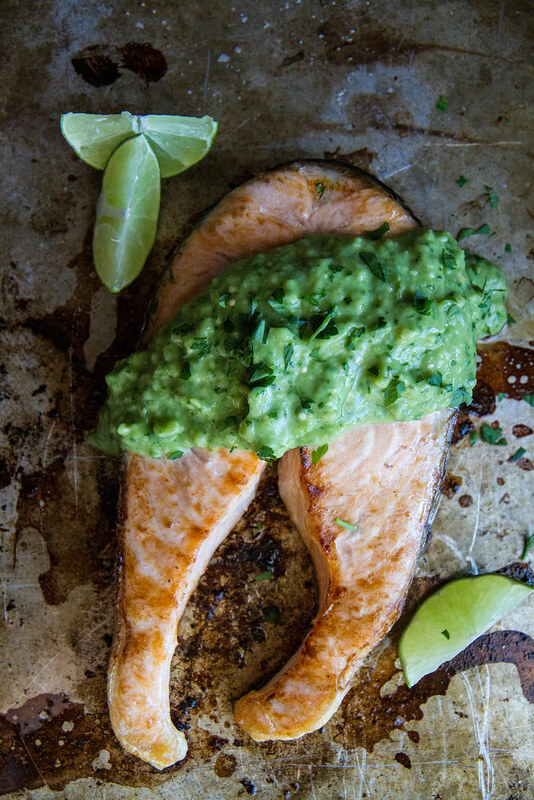 What an incredible clever idea to season it with this nice avocado sauce, I’m impressed! This was so quick and so amazing! I made the avocado cream in the container that came with my immersion blender. Fast and efficient! I substituted lemon as I was out of lime, and used wasabi paste in place of chilis, due to my nightshade sensitivity. The avocdo cream elevates the salmon to restaurant quality. Loved it! Thanks for the recipe!